The 71-year-old Fatal Attraction star stole the show at the Spirit Awards, collecting yet another accolade for her latest movie role. Source: Getty. With just hours to go until she finds out whether she has bagged an Oscar for her performance in hit movie The Wife, Glenn Close looked seriously cool as she posed on the red carpet at another US awards bash. With her adorable pet pooch Pip by her side, the 71-year-old Fatal Attraction star stole the show yet again, collecting yet another accolade for her latest movie role. And the adorable Havanese dog, who has his own Instagram profile, stood perfectly still as he watched his owner accept the gong for the 2018 movie, which also star Jonathan Pryce as Close’s on-screen husband. 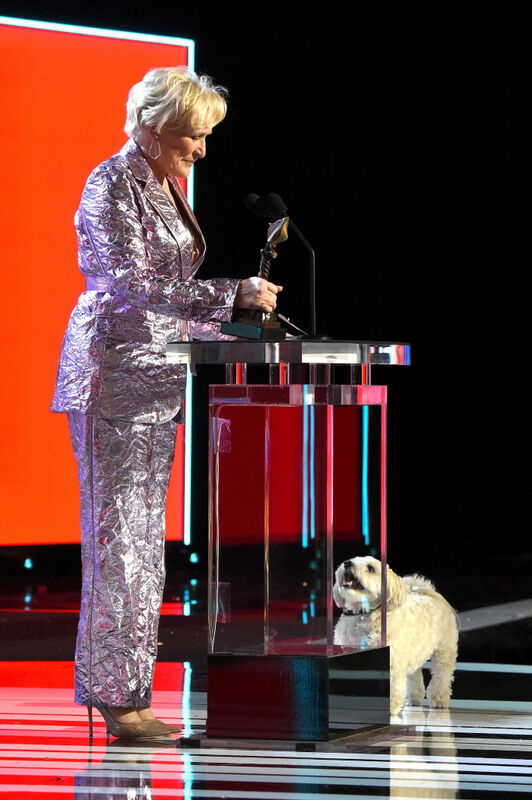 Accepting the award for Best Female Lead for The Wife on Saturday, Glenn delighted fans as she took Pip on stage. Source: Getty. Read more: Calls for more film roles for over-60s after Glenn Close sweeps up 2019 awards. 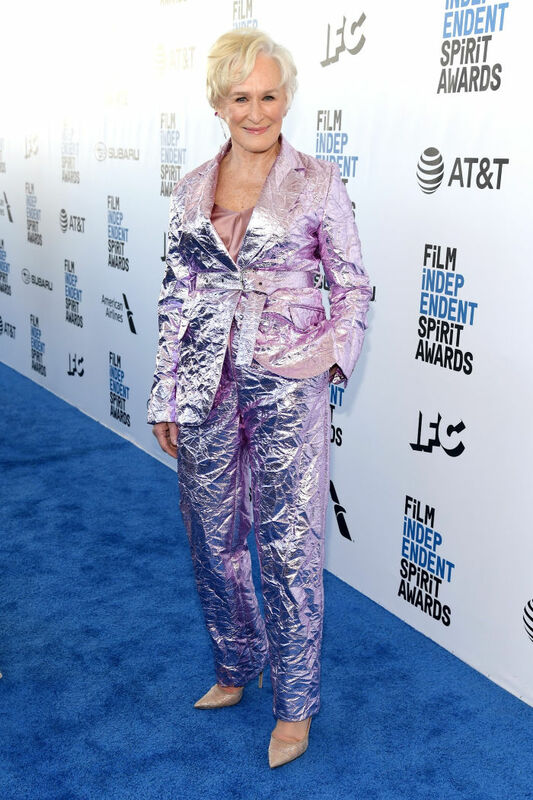 The iconic actress looked incredible for her most recent awards season appearance, dressed in an eccentric two-piece suit fashioned out of show-stopping crumpled metallic purple fabric. Close, who is known for her out-there sense of style, looked impeccable as she completed the look with a simple pair of pointed court shoes and a small pink clutch bag, and her signature ash blonde locks were swept to one side. Glenn has received seven Academy Award nominations, but is yet to take one home. Source: Getty. Read more: Stylish Glenn Close turns heads in vibrant ’70s-style outfit. On Sunday evening, Glenn will be hoping to collect the first Oscar of her career for her role as Joan Castleman, the wife of celebrated novelist Joe Castleman, in The Wife, based on the novel of the same name by Meg Wolitzer. She is up against The Favourite’s Olivia Colman, Lady Gaga for A Star is Born, Yalitza Aparicio for her role in Roma and Melissa McCarthy for Can You Ever Forgive Me? in the category for Actress In a Leading Role. While Close is yet to win an Oscar, she has been nominated a total of seven times. She has been up for the Best Supporting Actress category award three times, for; The World According to Garp (1982), The Big Chill (1983), and The Natural (1984). She has also been nominated in the Best Actress category an impressive four times, for her roles in Fatal Attraction (1987), Dangerous Liaisons (1988), Albert Nobbs (2011), and The Wife (2018). What do you think of Glenn Close’s outfit? Do you think she deserves to finally win an Oscar? Have you seen The Wife?